Fall is a season that calls for nice, warm breakfasts. And since it has finally cooled off a bit, I decided to share some of my new fall oatmeal flavors. Pumpkin pie spice. Apple pie spice. Apple chips. Raisins. Maple. Why do I love these jars so much? These are cheap (MUCH cheaper than buying the pre-mixed versions at the store). They’re easy: I usually spend 15 minutes prepping the jars for the next two weeks. All I have to do in the morning is add 2/3 to 1 C. of water- depending upon ingredients- and microwave for 2 minutes. Hot breakfast and always in flavors I love. I only ever eat flavors I love. No more buying the multi-pack and throwing out all of the banana cream. They’re a healthy breakfast option. Almost every combination below is under 250 calories. I’ve included the calorie counts for all of the fall oatmeal flavor combinations below. 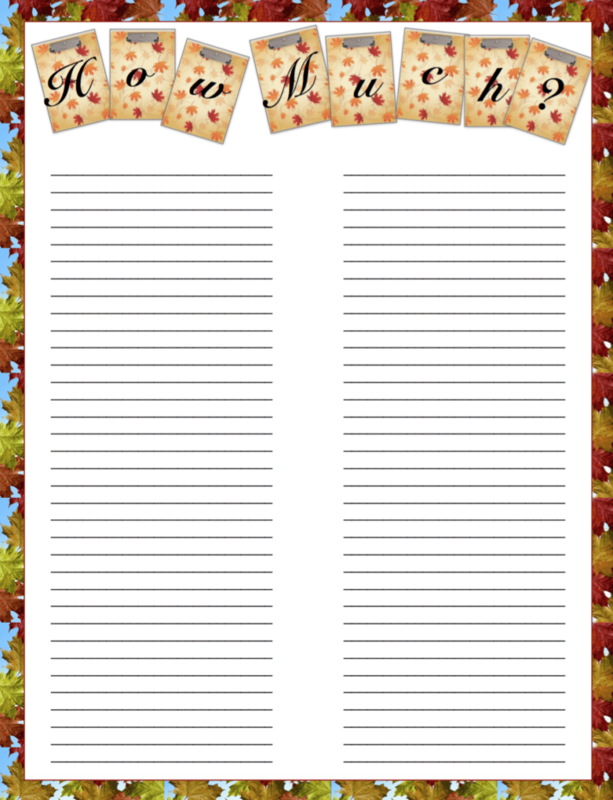 I’ve also included them in an easy printable. There are over 15 flavor options below. I’ve also included a blank printable in case you want to just write down your favorites, include some of the recipes from the original “Instant Oatmeal Jars” post, or start mixing and matching you own. Do me a favor? 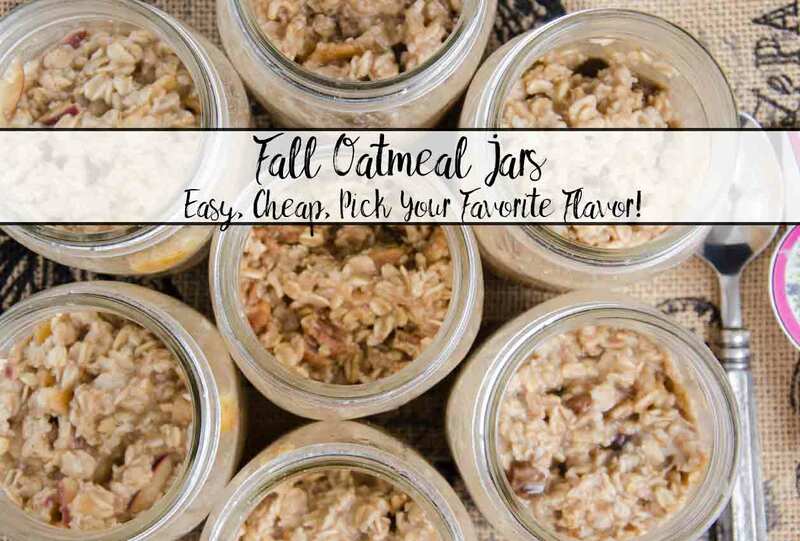 Comment below with YOUR favorite flavor oatmeal- store-bought or homemade. I would LOVE to include it in a future post! 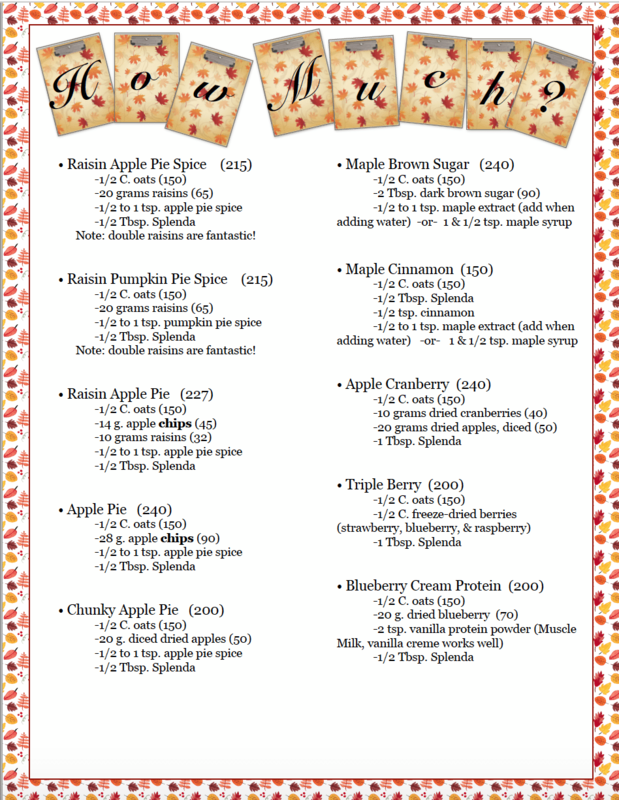 Flavor combinations below include: Raisin Apple Pie Spice, Raisin Pumpkin Pie Spice, Chunky Apple Pie, Maple Brown Sugar, Apple Chip Cinnamon, Pecan Apple Pie, & MORE! • Print options: regular paper works fine. Quaker Old Fashioned Oats- this is what I recommend. They taste great, they work well with the “process,” and they’re cheap. 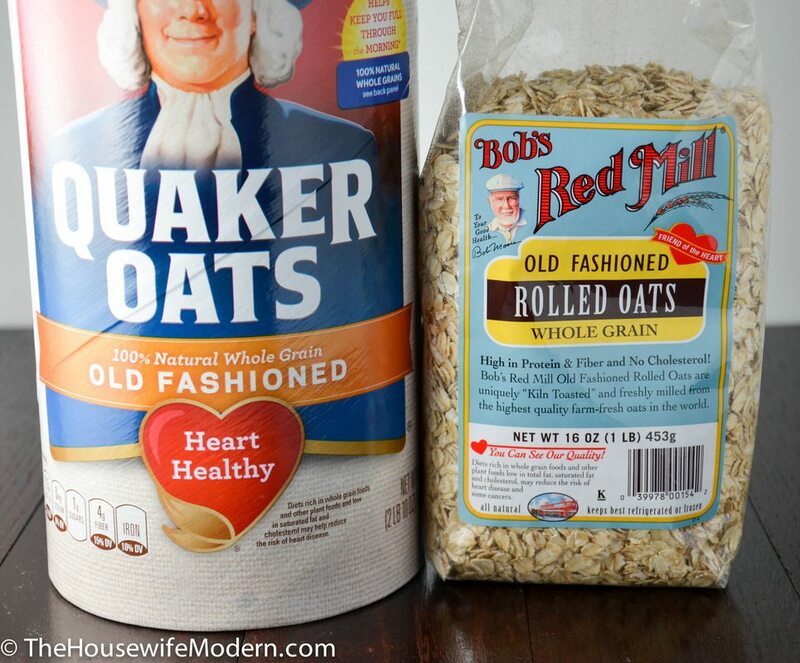 Bob’s Red Mill Rolled Oats (ones that cook in 5 min., no long cooking ones! )- they cook the same as the quaker, but I thought the taste was horrible! But if you’re looking for a more natural option, try this out. 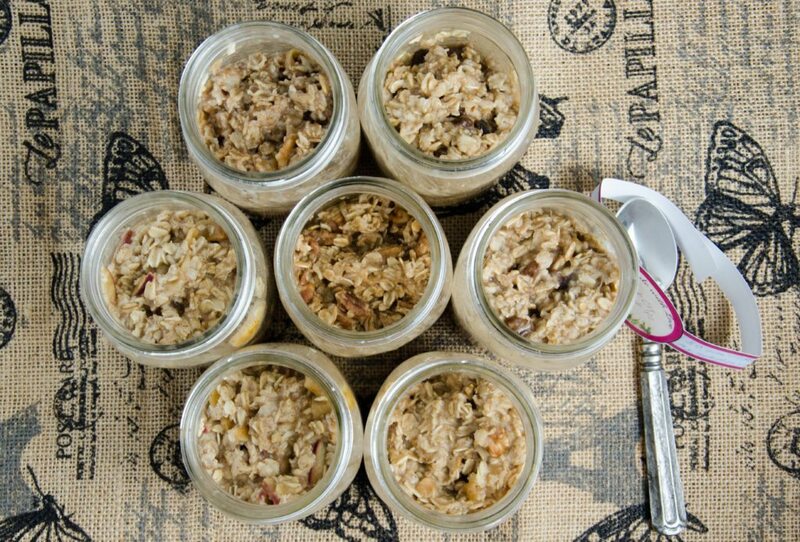 In mason jars, make sure you use pint; you’ll need the extra space as the oats swell up. I use these on a day-to-day basis because all I have to do is dump in the water, stir, and wait. Small snack bags; then pour into bowl, add hot water, and wait. I use these if I’m going to be traveling as they’re easy to pack. Otherwise, I hate dirtying all these little bags for reason. Boil between 2/3 & 1 cup of water (or milk) (amount of liquid depends upon how much fruit in jars). Stir into oatmeal jars, mixing well. Allow to sit (covered) 5-10 minutes until oats cooked. -or- (preferred), add water or milk to jar. Heat in microwave 2 minutes, stirring halfway through. I label each jar (including calorie information) with the labels in the picture below. I just fill them out once and re-use them. 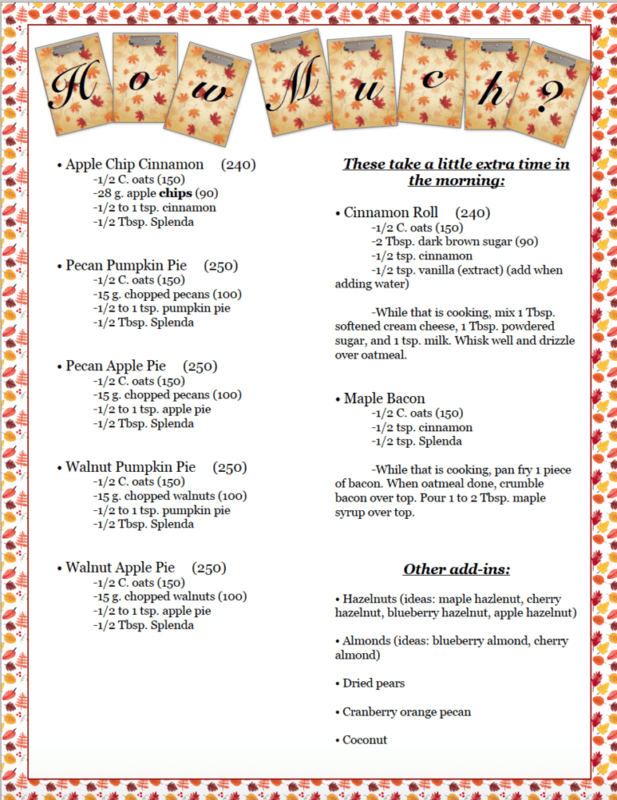 If you’re interested in said labels, please check out “Free Printable Canning Jar Labels“.